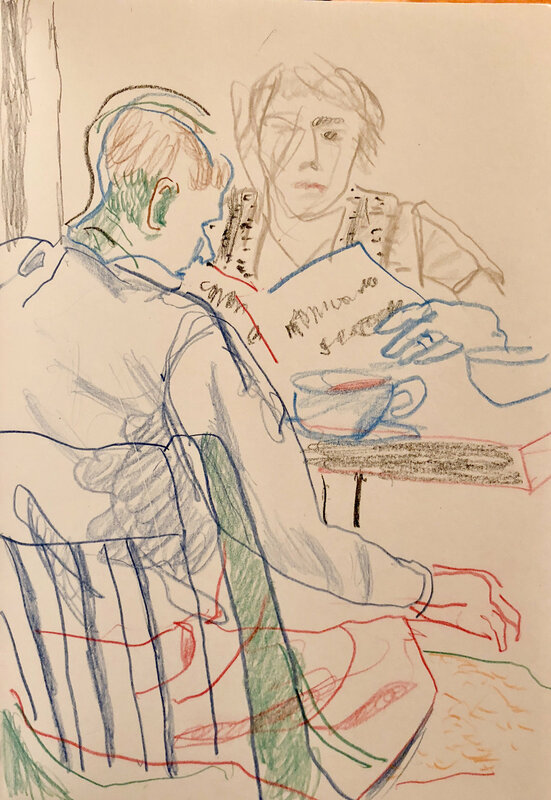 12:28 PM: yesterday in carbondale, colorado i made a drawing of a couple having coffee & a bite to eat. it stands apart from most of the other drawings in my latest drawing book, which i take with me everywhere. the others are almost all individual figures, focusing on the face, unually in profile, and maybe part of a shoulder. this drawing tells more of a story and thus is closer to the drawings & paintings i was making during my 15 years in greece. you can see some of these on the dropdown greece menu. the interaction between the two creates something of a mystery. is he ignoring her? is she bored reading the paper and thus gazing beyond the pages and into the distance?